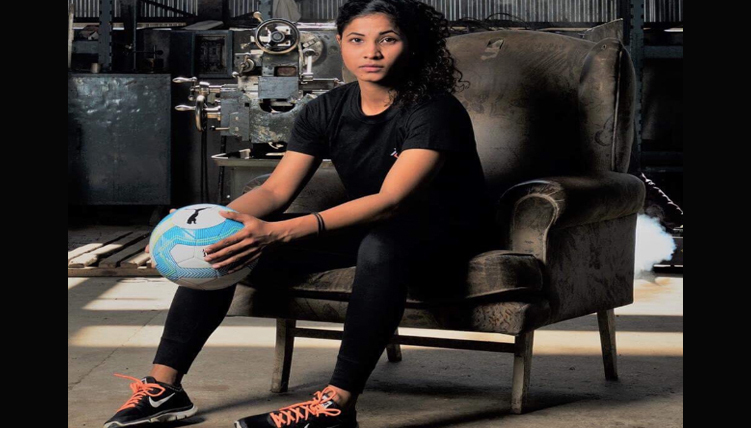 Hajra Khan is the first Pakistani woman footballer who is changing stereotypes. She is also the first woman from Pakistan to be signed by a foreign club. She was made the captain of Pakistan football team at the age of 20. She is a UNICEF ambassador. 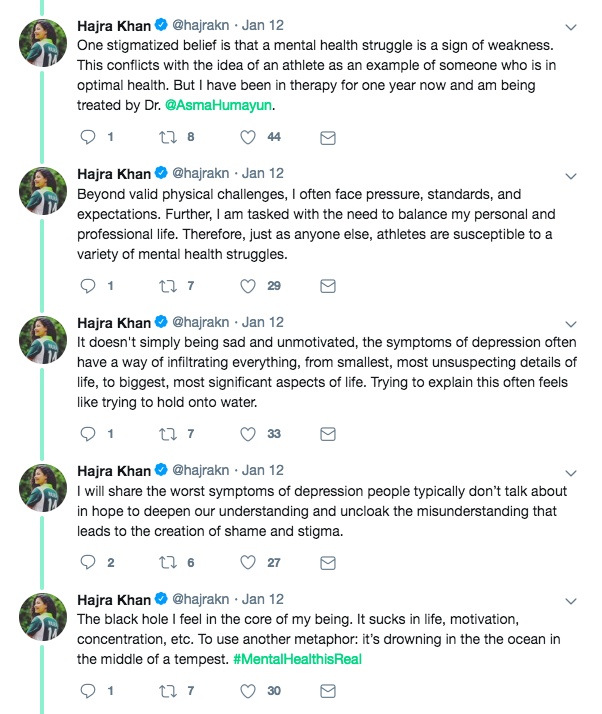 I feel, we all should be thankful to Hajra Khan or anyone who dares to share his/her state of depression for many reasons. 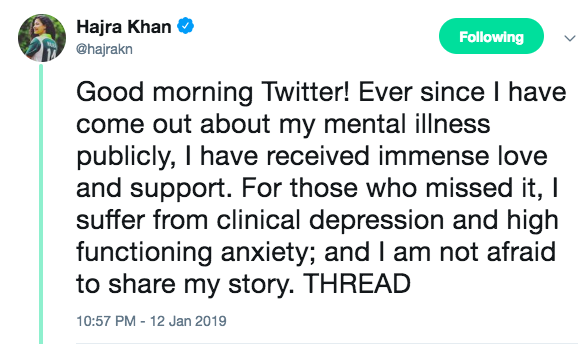 Unfortunately the patriarchal society that we live in, has taught us that depression is nothing but a tool to seek attention typically used by women. 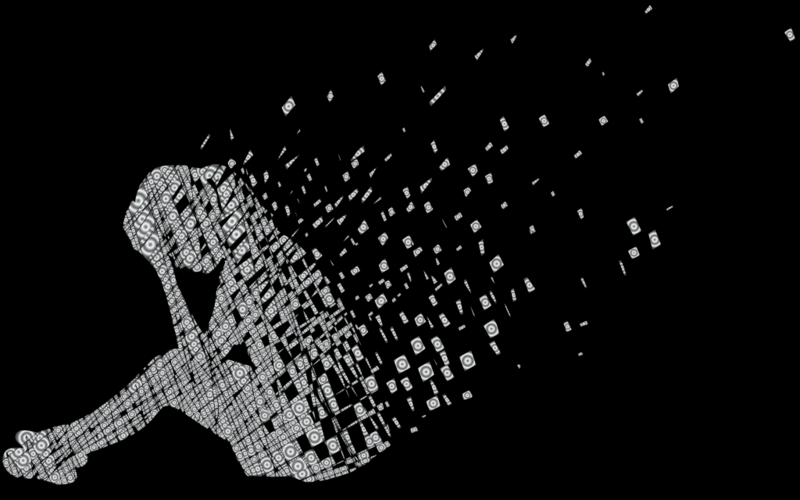 However according to my understanding which is not from any dictionary or medical science but personal observation, depression is an unwanted state of mind that can overcome anyone at any phase of life. It does not matter you are a male or female, your socio economic background, your haves or have nots, its just a state of mind. So we as society should be educated enough to give space to ones who are into such state of mind. 2. Recognise it rather Ignore it! 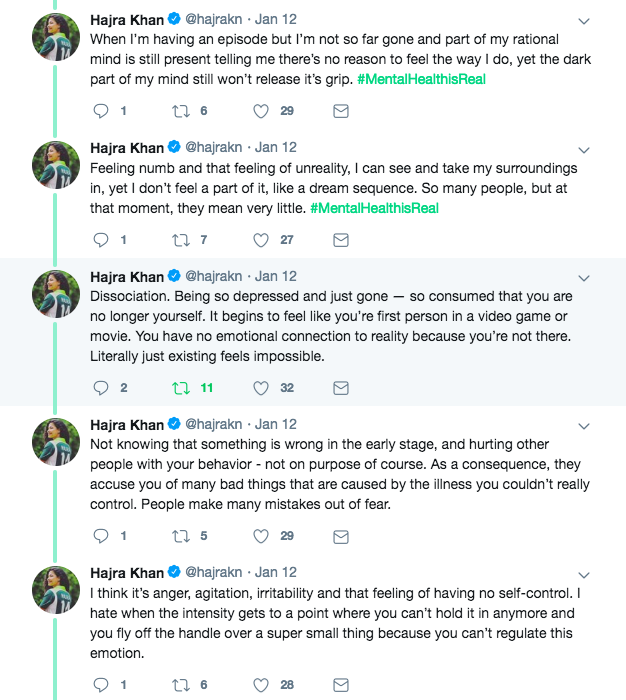 Because for majority depression is a taboo, so at first place the victim himself denies the fact that he is possibly having depression, then the society plays a vital role by explaining him/her that all is fine and then backbiting about him with a common phrase, kia nahi hai is k paas phir ye depression ka dhandhoora! Failure is the part of everyone’s life, thus everyone can face depression. If a person recognise it, only then he can cure it. 3. Please take help! Its Absolutely Fine! 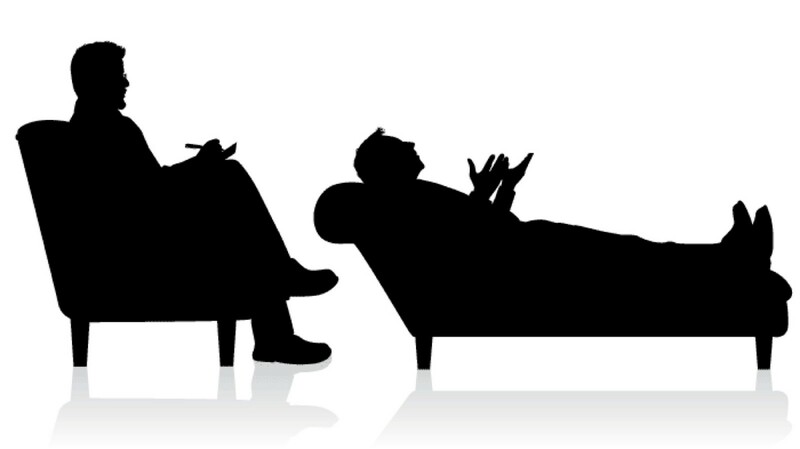 A major problem is, most of the people think that going for psychological help means you are a mental case and going to mental hospital. In the terminology of our jaahil society, you are paagal and going to paagal khaana. 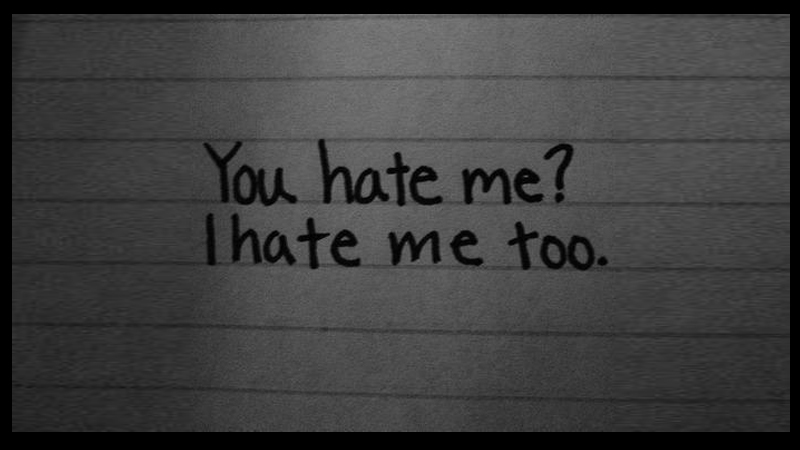 Very unfortunately it is true. Neither parents nor siblings nor friends realise the need of seeking help for victim. People do not understand the importance of catharses and bringing out the stress that sinks a person. Once depression is treated properly a person can have normal/ successful life. Similarly if it is ignored, it can ruin life or lives. 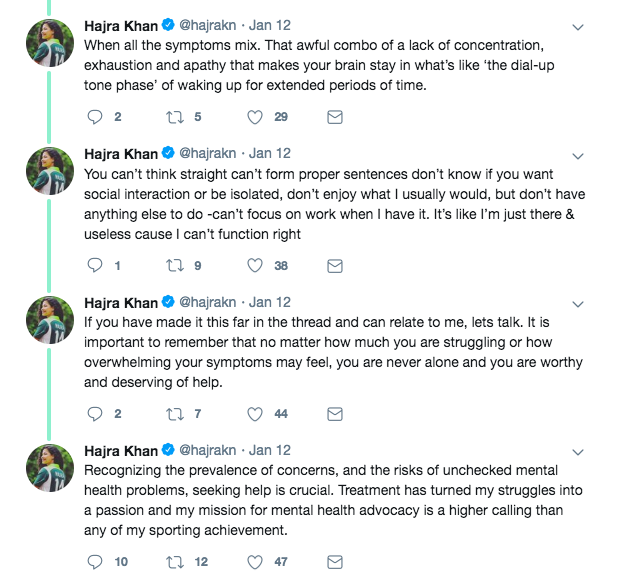 Hajra Khan and all those who share their stories are contributing a lot in mental health awareness which is much needed for our society.